The Baker's Nuts: Where's the new recipe and is he talking about peanut butter again? So I normally make it a point to do an update on the weekend. You may (but likely not) have noticed that it's Wednesday and there has yet to be an update. Now, this isn't just because I'm a lazy, I mean I am lazy, but that's not the reason why I haven't made an update. Monday night after finishing up work (I was working from home) my wonderful Macbook had a catastrophic hard drive failure and I am currently awaiting the replacement. Annoyingly enough I hadn't done a backup in over a week. I told myself all weekend that I needed to do a backup. The USB cable connected to my secondary hard drive is literally two feet away from me. But it would seem that the energy required to move that distance was beyond what I could muster (or wanted to muster :)). With this neglect I lost two recipe posts: a Red Velvet Cupcake from this past weekend and some nice dense cornbread. However, that one isn't ready yet, I'm still perfecting the recipe. So that's where the new recipe post is. Now let's talk about something else, peanut butter perhaps? This morning via Baking Bites I was directed to a Cook's Illustrated article comparing different brands of peanut butter, so obviously I was interested. After all, I do love me some peanut butter. The comparisons were being made with the more popular US brands in a number of categories. Obviously flavour and texture, but also its performance in cookies and in satay sauces. Two things stood out to me: First, most of these brands are not available in Canada (barring standard Skippy and Jif products). And second, the fact that 100% peanuts peanut butter is somewhat of a rarity. Now I am aware that the US has different PB classifications, but it's still strange to me that natural does not necessarily mean 100% peanuts. After reading the article I think I would like to invite the Cook's Illustrated people up here to try out some Kraft Peanut Butter. In my opinion Kraft PB from standard to 100% peanuts, from smooth to crunchy (even whipped and extra creamy) is the best by far. Their 100% Peanut PB is the smoothest I've tasted with great peanut flavour. There is no sugar, there is no salt, it's just peanuts. As expected, it's a bit stickier and might require a little more milk, but that's okay by me. It doesn't separate as much as other 100% peanut butters, and won't turn rock hard in the fridge. Regular Kraft PB makes some great cookies, both standard and flourless. It's not too sweet or salty and although I haven't put it in any sauces, you can never go wrong just eating it off a spoon. Better than Jif or Skippy, and better than PC. If you should try it, I think you'd agree (Yeah, I did that on purpose :)). 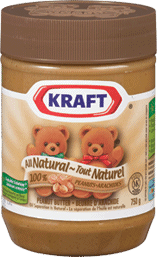 So if you're in Canada and haven't had Kraft PB in a while, I suggest you treat yourself to a jar. Honestly, I eat it five days a week. That being said, I feel I need to assure you that these opinions are completely my own. I am not affiliated with Kraft in any way. And despite what you might think, I have not sold my soul to them. Although, I can't say I am opposed to the idea either :). So happy your making Red Velvet cupcakes :) can't wait to try some. Will buy the Kraft PB next trip to the supermarket. Hopefully see you soon with Red Velvet cupcakes, peanut butter cookies and brownies. I love your 'review of the reviews' in Cook's Illustrated, and like you, I often have problems with their 'best ever' rankings. Too often they rate as 'best' what everyone is familiar with, which isn't necessarily 'the best' (such as ranking Hellman's Mayo over homemade versions). I tend to like the natural varieties for eating, but for baking a smoother and evenly-mixed consistency is imperative, which it sounds like Kraft has...I usually use Wegmans 'regular, non-natural' when I'm baking which isn't overpoweringly sweet like Jif or Skippy. I want peanut butter that tastes like peanuts rather than sugar, y'know! I don't think I could take something seriously if it said that store bought was better than homemade (except maybe in the case of McVities Digestives :)). And the awesome thing about Kraft PB Regular is that it doesn't overpower you with sugar and you still get good peanut flavour. I will alternate between it and 100% peanuts, sometimes craving one over the other. Though I typically only bake with Kraft Regular. Great, it's 10:30PM and I want PB :). Thanks Mary :) :P.